Romans 8:26-28 26Likewise the Spirit also helps in our weaknesses. For we do not know what we should pray for as we ought, but the Spirit Himself makes intercession for us with groanings which cannot be uttered. 27Now He who searches the hearts knows what the mind of the Spirit is, because He makes intercession for the saints according to the will of God. 28And we know that all things work together for good to those who love God, to those who are the called according to His purpose. Overall Background: The passage we just read takes us further into Romans 8. If you remember last week’s message – Romans 8 is the harbor/port to which the Christian life is headed. Romans 8 is where you and I as believers are to live. What is amazing to me is that as we get to Romans 8, the deeper Christian life—Paul does not deal with bible study (although that is important); he does not deal with worship (although that is important); he does not deal with evangelism (although that is important). What he focuses on is prayer! The thing that changes the most as we grow as Christians is how we pray. In other words, the more you know about Jesus Christ and what He has done for you and who you are in Him, it changes the way you talk to Him. For e.g. Nicole and I just celebrated our wedding anniversary. Through the 19 years that we have known each other, we have been through trials and difficulties and hardships. We have come to know each other better and deeper through those years. The one thing that has changed the most is how we talk to each other. In the same way, as we grow in the Christian life, the one thing that changes the most is our prayer life—how we talk with God. Application: Let me ask you this morning—how is your prayer life? One of the greatest privileges that we can have as Christians is the privilege of prayer. Prayer is a very important part of our lives. You cannot separate your Christian life from your prayer life. For e.g. Have you ever heard – “You are what you eat”? You are what you pray. If your prayer life is weak, your Christian life will be weak. If your prayer life is scattered, your Christian life is scattered. With the same token, if your prayer life is intact, you are intact. If your prayer life is sound, you are sound. In this passage Paul under the inspiration of the Holy Spirit is talking to us about praying in the Spirit. Let me qualify: This message is not about learning how to pray in the Spirit. This message is about knowing how the Spirit prays for us. In other words, this passage is not about the conditions for praying in the Spirit. It is about the assurance of the Spirit praying in us. As we look at this passage, this will become clear. Application: Let the Holy Spirit teach you what He is doing for you in prayer. He wants you to understand that you are never alone when you pray. When you kneel by your bedside, He is kneeling with you. When you are in that hospital room, He is sitting by you. When you are in your car, He is sitting next to you. Once you understand that as a Christian you are never alone when you pray, it will change the way you pray. 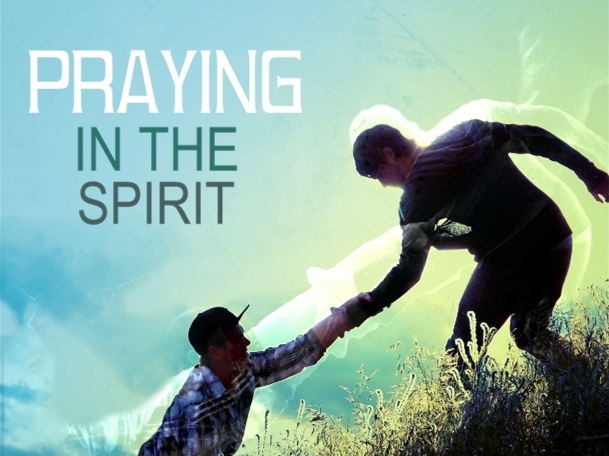 3 things Paul tells us about praying in the Spirit. I. THE HOLY SPIRIT KNOWS OUR WEAKNESSES. 26Likewise the Spirit also helps in our weaknesses. Physical weaknesses – our blood pressure goes up and our blood pressure drops, our sugar goes up and our sugar drops, hypothyroidism and hyperthyroidism. We become anemic, dehydrate, get sick, and the list goes on. God knows them all. Emotional weaknesses – we get emotionally drained, confused, loose our temper. We feel unloved, feel insecure, feel depressed, and the list goes on. God knows them all. Spiritual weaknesses – we struggle with old habits, indwelling sin, selfish nature. We don’t know how to love others; we don’t know how to let go of the past, we don’t know what the future holds, we don’t know what is the best road to take, we don’t know God’s will for our lives, we don’t have the faith we need to keep going and the list goes on. The Spirit knows them all but He does not condemn us for our weaknesses. Instead, He comes to help us with them. The word “helps” has the picture of someone helping another to carry a heavy load. Imagine someone trying to drag an enormous log. He can barely move it. Then someone comes and picks up one end and together they carry it. God does not condemn us in our weaknesses. In fact, He understands. Hebrews 4:15-16 15For we do not have a High Priest who cannot sympathize with our weaknesses (the same word as in Romans 8:26), but was in all points tempted as we are, yet without sin. 16Let us therefore come boldly to the throne of grace, that we may obtain mercy and find grace to help in time of need. Application: This morning I don’t know what image you have of the Holy Spirit in your mind. Sometimes they enemy will implant a false/negative image of God, where God is constantly frowning, displeased, disappointed, and unwilling to understand. Then we give someone else that position that only belongs to Him. We think that a friend or spouse or family member will understand our weaknesses. That’s just not true. Only the Holy Spirit understands our deepest weaknesses. 1. The Holy Spirit knows our weaknesses. II. THE HOLY SPIRIT KNOWS WHAT WE SHOULD PRAY. Background: One mark of growth in the Christian life is not knowing how to pray. For e.g. Children always know what to ask for. They ask whatever they want and they expect whatever they ask. “I am hungry. Can I have ice cream?” “I am tired. Do I have to go to school?” “That toy on TV—can I have it?”Grownups know better. We know that we cannot ask just whatever comes to our mind. We know that everything has a price and consequences. #1 Sometimes we don’t know what’s best for us. In matters of relationships, careers, and financial decisions, the answers are not that simple. Life is much more complicated. We don’t know what is best for us. We don’t know what to ask for in prayer. Sometimes the more something means to us, the harder it is pray for it. For e.g. It is so much easier to pray for some missionary down in Africa. How much harder it is to pray for a brother or a sister who is suffering with cancer. By the way, aren’t you glad that God didn’t answer all of your prayers?! Can you imagine where you would be today if God had answered some of your prayers? “Some of God’s greatest gifts are unanswered prayers.”- There’s Garth Brooks for you. #2 Sometimes we don’t realize what is best for others. Not only that but we don’t know how to pray for others. For e.g. Sometimes people will ask me to pray but I don’t know exactly how to pray for that situation. They will ask for prayer in a relationship and I agree but I don’t know how to pray. Is this person ready for a relationship? Is the other person ready for a relationship? Should this person finish school? Should this person get a job? What job? I don’t know how to pray. That’s why most of this “name it and claim it” stuff is junk. There is no Holy Spirit in it. There is nothing but self in it. We don’t get anything from God. We only get disappointed, turn bitter, and leave a bad testimony. That’s why we need the Holy Spirit to pray for us. He knows the mind of God. He knows our past. He can see our future. He knows what is best for us. He knows what will bring the best for everyone involved. He knows what will grow God’s Kingdom. Application: Let me ask you this morning – Do you know what to pray? Have you come to the point where you have said—“Lord, I don’t even know what to pray.” The sooner you can say that, the better. This is why the Holy Spirit has come to dwell in your heart. 1. The Holy Spirit knows our weaknesses; 2. The Holy Spirit knows what we should pray. III. THE HOLY SPIRIT INTERCEDES FOR US. Background: At this point in the passage, people leave the Bible and make their own assumptions. They will say – “Groanings that cannot be uttered” – that is speaking in tongues. Read that again carefully: but the Spirit Himself makes intercession for us (Meaning: the one who makes intercession is not you. He is the Holy Spirit) with groanings which cannot be uttered (Literally – wordless groaning). What are groanings? The Greek word is “stenagmois” means deep sighs. When you and I sigh, we do it out of frustrations, anxiety, and doubts. When the Holy Spirit sighs, it is not out of any kind of anxiety but it is the sigh of a burden. He knows and senses how we are feeling and carries those feelings into the Trinity. Also, all this is in wordless groaning. Meaning: You and I cannot even hear the sighs or the words. This conversation is taking place in the Trinity. It never even reaches our consciousness. But it reaches the Father. Listen to verse 27 “Now He who searches the hearts knows what the mind of the Spirit is, because He makes intercession for the saints according to the will of God.” Meaning: When we are weak and we don’t know what to pray, the Father looks deeper to hear the prayer of the Spirit. He answers the prayer of the Spirit because the prayer of the Spirit is God’s perfect will for us. You and I cannot have the assurance that God will bring something good out of something bad without the Holy Spirit showing it to you. For e.g. In the December of 1993, I was at the lowest point in my life. I had lost everything. Christmas time and I had nowhere to go. My brother called me up and said you are coming to Philadelphia. Some friends gave me a ride and dropped me at the appointed exit. Only problem, the South bound exit was at the other part of that town. It was cold. I stood at this gas station by the phone booth. The Sun went down. It became freezing cold. I hadn’t eaten. 8pm became 9 and 10 and 2 in the morning. I knew I couldn’t stay in that phone booth all night. I am walking down this dark, deserted road, past houses – no lights. Not a single car in sight. I thought to myself – this is where I will die. But the Holy Spirit gave me the assurance that all things work together for good. I heard this car coming from behind. It was my brother. God was looking out for me that night. I tried to remember what I prayed that night. I couldn’t because I wasn’t the one praying. The Holy Spirit was groaning with words that could not be uttered. Invitation: If you don’t know Christ, you do not have the Holy Spirit. But if you do, you are never alone.